With the construction, the conglomerate has fully integrated the entire value chain of photovoltaic power: Hanwha Chemical manufactures primary component polysilicon; Hanwha Solarone handles secondary components ingots and wafer cells; Hanwha Solarone and Hanwha Q Cells manufacture cells and modules that make up solar panels, and; Hanwha Q Cells Korea partakes in bids and builds and operates photovoltaic power plants. Korea will build as many as 18 thermal power plants by 2027 while also significantly expanding the generation capacity of clean, renewable power sources, such as solar and wind farms, the government said yesterday. The move comes as the country’s electricity consumption is expected to grow by an annual average of 2.2 percent, from 482.5 billion kilowatt-hours this year to 655.3 billion kilowatt-hours by 2027. The country’s peak power demand is expected to grow at a faster rate of 2.4 percent per year from 79.7 million kilowatts in 2013 to over 110 million kilowatts in 2027, according to the Ministry of Knowledge Economy. The government sets a 15-year power supply plan in place every two years. The latest is the sixth of its kind. Under the new plan, the government seeks to increase the total generation capacity of clean, renewable sources to 12 percent of total consumption in 2027, compared with only 7 percent in 2025 under the fifth power supply plan announced two years earlier. The nation’s clean energy businesses are going downhill, squeezed by a slump in domestic demand and exports, according to a report. The report released by the Renewable Energy Center under Korea Export-Import Bank forecast that sales of the local renewable energy industry were expected to post minus growth this year over 2012, mainly due to slow local demand. Sales in the clean energy industry have shown a downward trend for two consecutive years in 2011 and 2012, after peaking in 2010 at 8.1 trillion won ($7.5 billion). In sharp contrast, the global renewable energy market has continued to grow amid the world’s economic downturn for the past five years and it is expected to grow 4 percent to $271.3 billion this year compared to more than a year ago, CleanEdge, a U.S. energy consultancy, said. The local renewable energy industry also hasn’t performed well in exports since 2010. Outbound shipments are forecast to fall 9 percent on-year to $3.82 billion this year, which will be the biggest drop in three years, the Renewable Energy Center said. Hanwha will press ahead with the domestic production of solar modules as domestic demand for solar modules is expected to increase on the back of Korea’s adoption of a Renewable Portfolio Standard (RPS) – a regulation that requires the increased production of energy from renewable energy sources.On Tuesday, industrial insiders said Hanwha Solar Energy, a solar power subsidiary of Hanwha Chemical, was consulting with Korean module manufacturers over the OEM production of solar modules. Hanwha Solar Energy is expected to go for the production of photovoltaic modules by using well-established manufacturers’ production lines. Once Hanwha Solar Energy provides peripheral materials including solar cells, the selected contractors will assemble parts into finished goods. Samsung Electronics isn’t the only company looking for new growth engines. Others companies including OCI and Woongjin are on an active search for new businesses outside their current specialties. But like the tech behemoth, many are stuck for ideas. 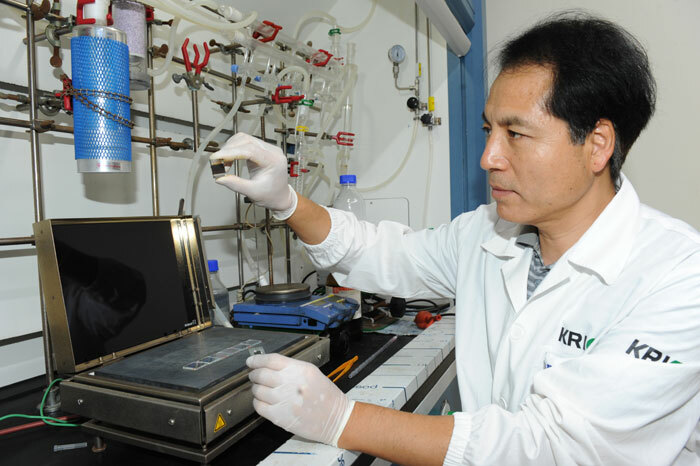 The idea that Korea needed new growth “engines” became popular in 2009 when the Lee Myung-bak administration said green technology, industries converging and high-end services were the keys to the nation’s economic future industries. With the government’s inspiration and encouragement, many companies have jumped into those fields – with very mixed results. One such business is solar cells, which was once deemed the next generation of renewable energy. Today the solar battery business across the globe is in a funk because of an excessive supply flooding out of China, which has caused polysilicon prices to plummet. The price of polysilicon, which was $200 per kilogram in 2008, recently plunged to $15. And Europe, which is the world’s largest market for solar cells – accounting for more than 70 percent of demand – continues to struggle with its fiscal crisis. Seoul Metropolitan Government unveiled a plan to install solar panels on around 10,000 buildings, schools and houses by 2014. The city aims to increase the use of photovoltaic energy to 320 megawatts of electricity by that year. Half of the energy will be generated from rooftops or idle facilities of public offices and schools, while the other half from private buildings and houses. The city will also make an online solar map that shows the expected generating capacity of the solar power and whether buildings and houses can be equipped with photovoltaic facilities.